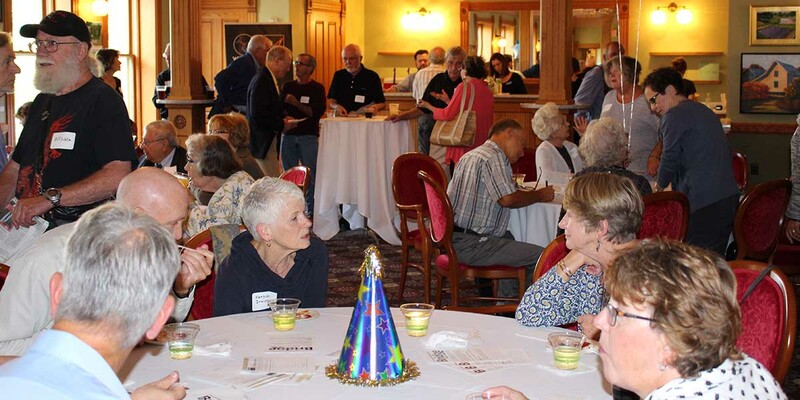 A full house last Thursday at the Traverse City Opera House to celebrate Bridge Magazine’s 6th birthday. Mmmmm… Cake! Come get your piece at Bridge’s Grand Rapids and Detroit parties in September. Bridge readers share a laugh in Traverse City. 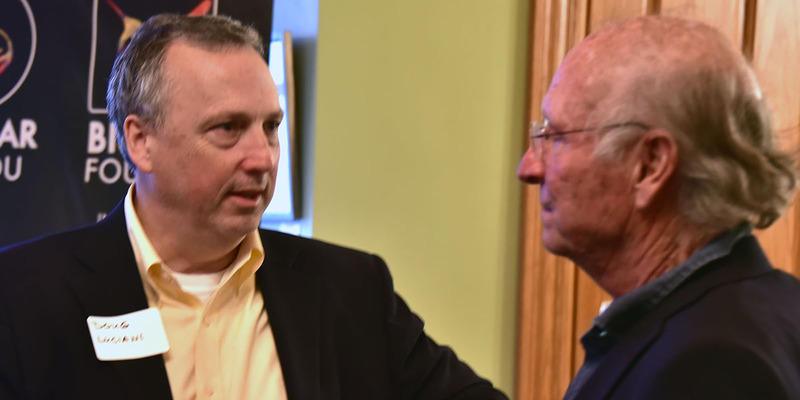 Center for Michigan/Bridge Magazine President and CEO John Bebow chats with the Honorable Thomas G. Power, 13th Circuit Court judge in Traverse City. 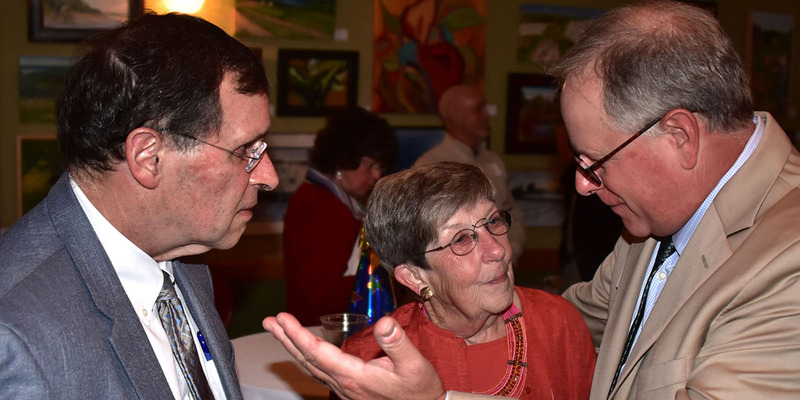 In the early 1990s, Bebow was a Traverse City Record-Eagle reporter who covered Judge Power when Mr. Power served in the Michigan Legislature. The Center for Michigan public engagement team hard at work. Amber Delind (left) and Allie Schmidt (right) get the party started. 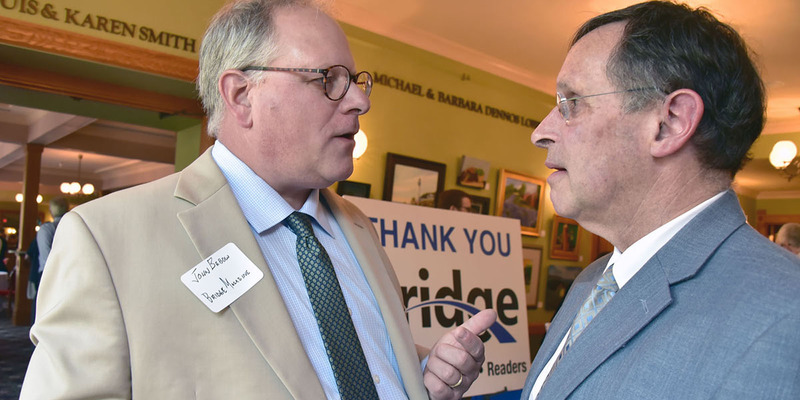 Center for Michigan/Bridge Magazine President and CEO John Bebow chats with longtime Bridge reader and supporter Doug Luciani, chief executive director of TraverseCONNECT (the parent organization of the Traverse City Area Chamber of Commerce and Venture North Funding and Development. 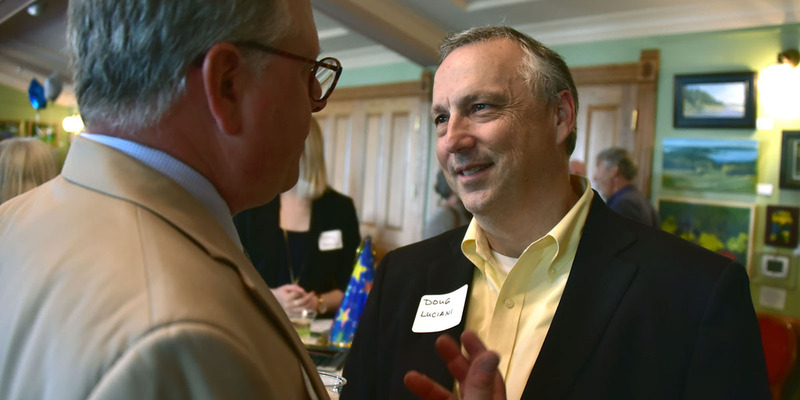 Luciani is co-chair of the Childrens Leadership Council of Michigan, a statewide business roundtable which has successfully advocated for doubling the size of Michigan’s public preschool program. 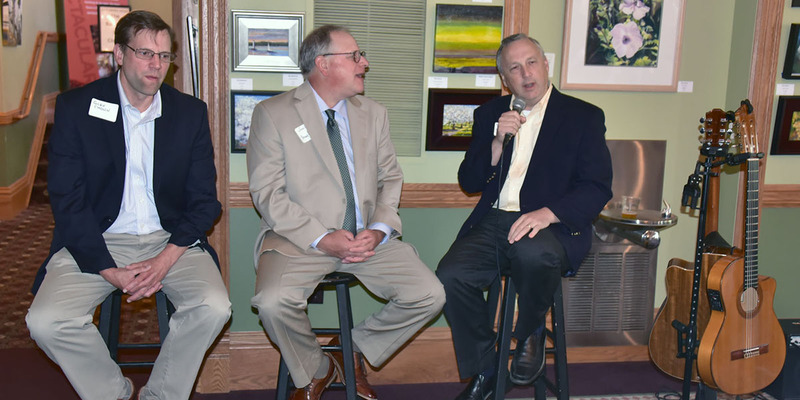 Bebow talks politics and news with local Traverse City business leader Doug Luciani (right) and Glen Chown, executive director of the Grand Traverse Land Conservancy (left). Question and answer time with Bridge readers. 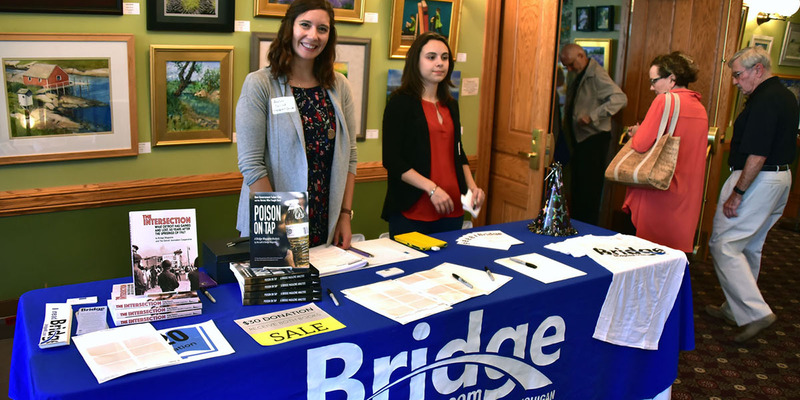 Come to our events, make your voice heard, tell us what you’re curious about, tell us what you need to know so Bridge can bring you the facts about Michigan’s future. It looks serious, but, really, we just have a good time! 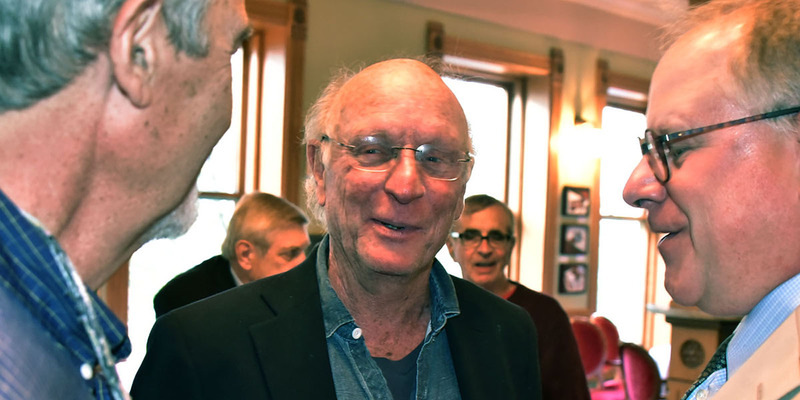 Bebow chats with legendary Traverse City environmental attorney Jim Olson (center) and retired Detroit Free Press politics editor and author Bob Campbell (left). 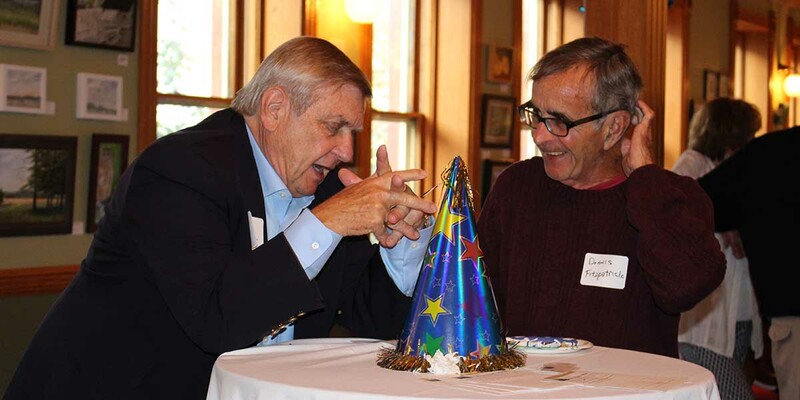 Traverse City leaders Doug Luciani and Jim Olsen share some insights. 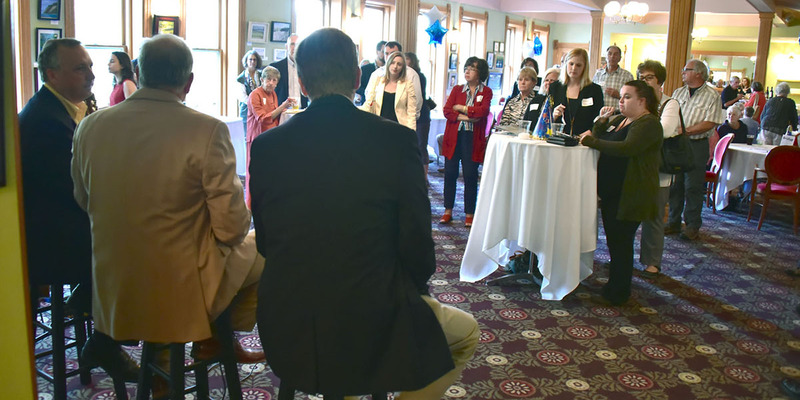 Thanks to everyone who came to the Bridge Magazine birthday party in Traverse City! It was great seeing everyone, and we really appreciated your feedback and questions. Special thanks to our guest speakers, Doug Luciani, Chief Executive Director of TraverseCONNECT and member of the Children’s Leadership Council of Michigan and Glen Chown, executive director of the Grand Traverse Regional Land Conservancy as well as guitarist Ron Getz for supplying a fantastic soundtrack for the evening. Next up is Grand Rapids on September 7 from 6pm-9pm at Founders Brewery. This event is free but space is limited, so please RSVP today! 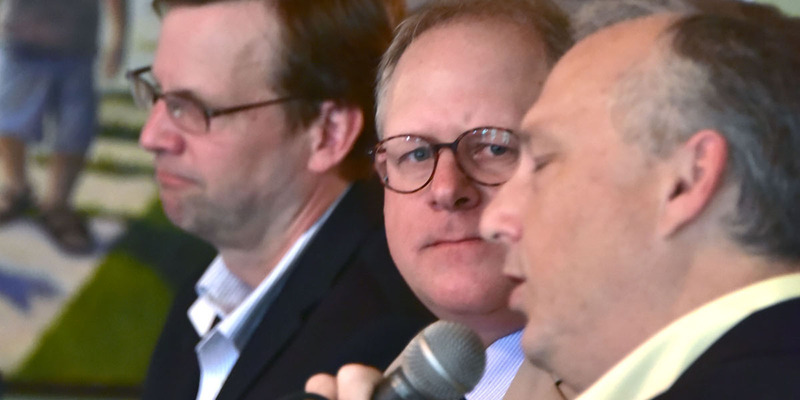 Join special guest Ken Sikkema, Senior Policy Fellow at Public Sector Consultants and former Michigan Senate Majority Leader​, and Grand Rapids Area Chamber of Commerce Vice President Andy Johnston​ with live music by Kevin Nichols​. All I have seen about these Birthday parties is that they have no agenda, and by the photos it is about Bridge staff meeting with local celebrities. That is to bad, this could have been a great opportunity for Bridge to pick the thinking of reader to see what they think the future of news and a magazine like Bridge could be. It could have been and opportunity for reporters to educated readers in how stories are selected, see if readers have ideas for future stories, reporters could explain why so often it seems the story title seems to miss the point of the story, and reporters could have describe the types of comments that would help reporters improve their stories to fit the readers needs/wants. It seems this could have been and opportunity to talk about new/innovative features that Bridge might be interested in or at least hear why readers may want such features. 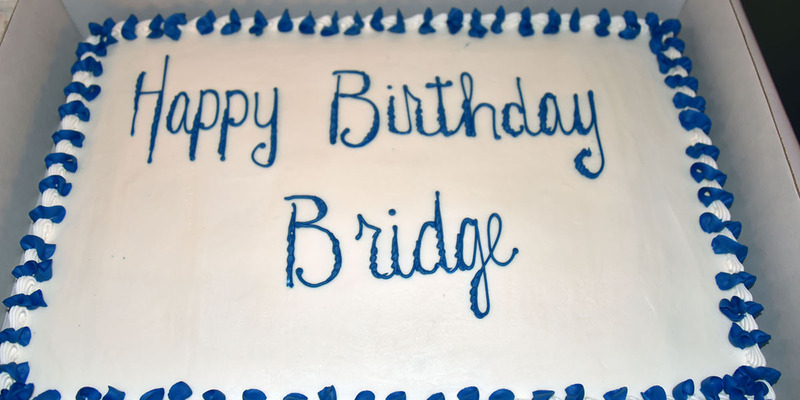 But none of the seems to be part of the Party, so Happy Birthday Bridge and a wish for many more, and thank you for the platform you have created and the opportunity to listen to other readers that make me think. I attended the 5 year birthday party last year in Ann Arbor. Along with comments and reflections from Phil Power, the evening included introduction of the reporters, some commentary by each of them and then questions from the attendees were taken - many different topics came up. I'm planning to attend the Detroit event and hope it will be similar.